Please take an overview of the career chances at RMG. We are looking forward to hearing from you! 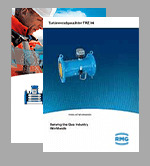 The company RMG Messtechnik GmbH is a successfully active subsidiary of an international company group in the field of the gas metrology at home and abroad. The company with more than 150 employees in Germany is located in Butzbach (near Frankfurt), Zorneding (near Munich) as well as Beindersheim (near Mannheim). RMG provides development, production, sale and maintenance of its high-quality and sensitive products. Energy supply companies, investment companies and industrial concerns appreciate RMG as a reliable Partner. The employees of our company are qualified experts and engineers who live their passion for gas metrology – in development projects, in manufacturing, in the service and sales – nationally as well as internationally. We are always interested as a company in the hiring, the development and promotion of starters and qualified professionals. The RMG downloadcenter shows you all important documents at a glance. You will find what you are searching for. Contact us whenever you have questions or need some support. Our experts are here for you around the clock. I have read the privacy statement and agree to the contained data protection regulations.